I get emails. Lots and lots of emails. Every day. Mostly from women, but I do get some from men as well. Almost every one of these emails contains a question about ADHD. Some ask several questions because the information they seek is not always easy to find. I love researching and answering, but unfortunately, I cannot give thoughtful answers to everyone due to the volume and lack of time. My saving grace is that the vast majority of questions center around a few select topics. 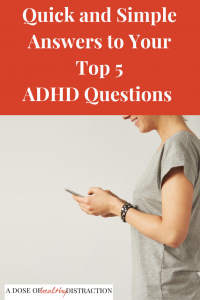 Women with ADHD are a unique group, and since I am one of them I am in a position to offer support and education, which is a role I cherish. How do I create a structure in my day? This question is essentially one about time management. ADHD adults do not always have a great relationship with time. We struggle to estimate how long things take, and we sometimes just plain forget to look at the clock. Decide what time to start your day, at home or at work. Make a decision and commit. (For me this is 9:30 a.m.) Set multiple alarms if you need to about this daily start time. Check out my post on monotasking. Decide how to kickstart your day. For example, at work you might fill a water bottle to signal your brain it’s time to start. At home, you might brain dump for five minutes in a journal to signal your brain. DO NOT GET ON FACEBOOK. It doesn’t matter what your kickstarter is – this will be your go-to when you don’t know where to start. Write down no more than three major tasks. Don’t make a huge to-do list. Then, use a timer and work in short 15-30 minute bursts. Take breaks in between. Set the timer for your breaks as well. “Check-in” with yourself in the middle of the day. At the end of the day, check-in again. Acknowledge what you did do. Let go of the need to do all the things perfectly. How do I manage my mood? ADHD is a problem with executive function and self-regulation. Both of these are abstract concepts, but these are the words we use to describe impaired neurological processes. Executive function includes emotional regulation, so when you add in the hormonal aspects of being a woman it can get complicated. I create programs and products to help you with this. Create a plan for how you can take care of yourself. I don’t mean getting pedicures and massages. For me this list includes sleep, alone time, a warm cup of tea/coffee, and journaling every day. Your plan should also include the people who make you feel understood, and objects that soothe you or bring you comfort. Here is a link to my EAP where I walk you through creating your own plan. Create a night time routine first. Then move on to the morning. Do as many things each evening as you possibly can so that you have less to remember and think about in the morning when you are stressed. Inventory your pantry. Make a list of pantry staples, and restock with said staples. Create a list of at least 10 meals you know your family will eat. Explain to your family that you struggle with meal planning, and so you will absolutely not be cooking every day. You are not obligated, no matter how much they complain, to accommodate everyone all the time. 4. Each week choose a few of the meals above to prepare. You can prep and make them all at once, or you can spread them out over the week. 5. Create a shopping list based on which meals you plan to make. Try not to shop more than once per week. Meal Planning Ebook to make your life easier. No really, I get emails with, “HELP” in the subject line. I always feel bad when someone emails me and says everything is a mess and they think they are stupid. You are not stupid. You have ADHD and executive function disorder. And you are certainly not alone. Educate yourself. Visit me at ADDA, and CHADD. Join a support group, preferably not just on Facebook. Remember that attitude is everything with ADHD. Growth mindset is a choice and it requires you to work on it every day. If you can manage your own emotions and learn how ADHD affects YOU – things will get better. Try my ADHD Explained Card Deck to get you started.